From director Mel Gibson, the Golden Globe-nominated HACKSAW RIDGE arrives on Digital HD on February 7 and on 4K Ultra HD Combo Pack (plus Blu-ray and Digital HD), Blu-ray Combo Pack (plus DVD and Digital HD), DVD and On Demand February 21 from Lionsgate Home Entertainment. Based in the incredible true story of one man’s faith, strength and courage during one of the bloodiest battles of WWII, the Golden Globe®-nominated Hacksaw Ridge arrives on Digital HD on February 7 and on 4K Ultra HD Combo Pack (plus Blu-ray and Digital HD), Blu-ray Combo Pack (plus DVD and Digital HD), DVD and On Demand February 21 from Summit Entertainment, a LIONSGATE Company. From Academy Award®-winning director Mel Gibson (Best Picture, Braveheart, 1995), with screenplay by Robert Schenkkan (The Quiet American) and Andrew Knight (The Water Diviner), Hacksaw Ridge features breathtaking visual effects and stunning production design and has been nominated for three Golden Globes®: Best Picture – Drama, Best Director – Motion Picture, and Best Actor – Motion Picture for Andrew Garfield. Garfield (The Amazing Spider-man) gives a moving performance as American hero Desmond Doss, alongside an all-star cast, including Sam Worthington (Avatar), Luke Bracey (Point Break), Teresa Palmer (Warm Bodies), Hugo Weaving (The Lord of the Rings franchise), Rachel Griffiths (Saving Mr. Banks), and Vince Vaughn (HBO’s “True Detective”). 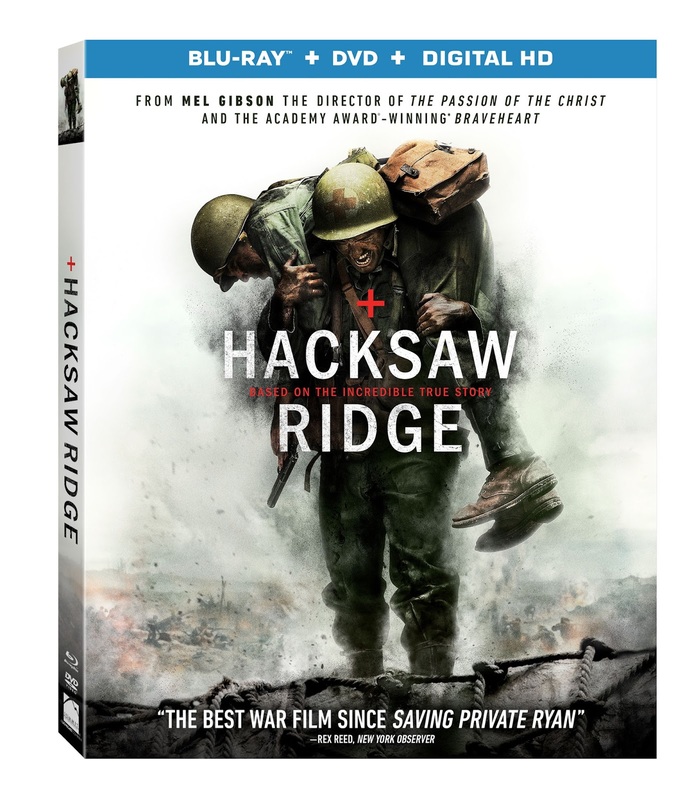 The 4K Ultra HD, Blu-ray and Digital HD releases feature an in-depth, behind-the-scenes look at the film in “The Soul of War: Making Hacksaw Ridge,” a comprehensive documentary detailing the making of the film, including the real-life people and story, casting, filming, special effects and stunts with interviews from Mel Gibson, Andrew Garfield and others. In addition, the release will contain deleted scenes and a special Veterans Day Greeting from Mel Gibson. The DVD will feature deleted scenes and the special Veterans Day Greeting. The 4K Ultra HD and Blu-ray discs of Hacksaw Ridge will feature Dolby Atmos audio remixed specifically for the home theater environment to place and move audio anywhere in the room, including overhead. 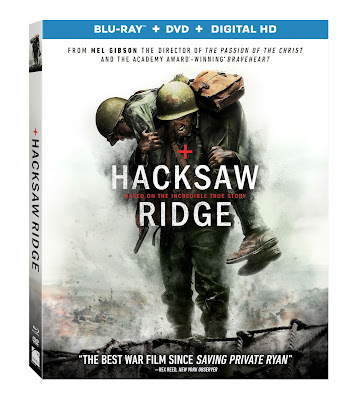 Hacksaw Ridge will be available on 4K Ultra HD Combo Pack, Blu-ray Combo Pack and DVD for the suggested retail price of $42.99, $39.99 and $29.95, respectively.